The Hypnagogic Light Experience with Lucia N°03 achieves without any effort or long-term practice: - emotion-and-brains Webseite! 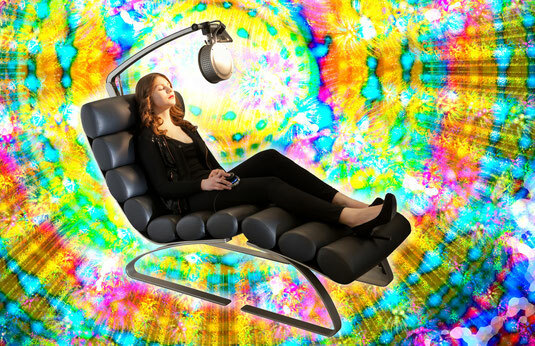 The ultimative light experience with Lucia N°03 Hypnagogig Light Experience makes it possible to experience well-being as conciousness, which – superimposed by thinking and feeling – can not be reudced to physical or psychological process. From this perspective, well-being can never lost, but overlocked at most. Through Hypnagogic Light Experience the portal opens to a journey that begins at its destination: the common source of light and consciousness. Under special conditions, a “light experinece“ leads to profound changes in attitude and thus to a total reorientation of the organism. Cruise Ship with SPA / big Yacht etc. The new world of experince! 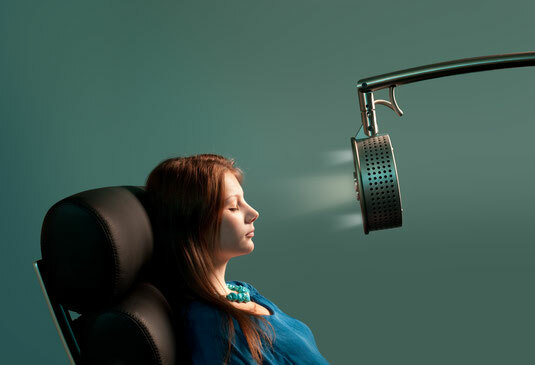 The patented innovation and world novelty Lucia N°03 is now available in a comprehensive package solution for fast and successful integration into existing or new wellness. 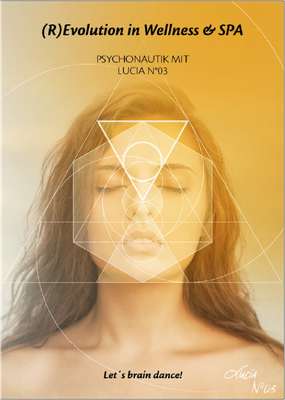 Psychonautics with Lucia N°03 expands your SPA offering to a whole new, holistic level of immediate awareness. On unique, through-composed journeys of light your guest experiences another dimension of his being. A session with Lucia N°03 takes about 30 minutes. Lucia N°03 comes as a complete package with 36 programs for a variety of experiences such as "let go and arrive", "activate self-healing powers", "total relaxation", "deep meditation and ancient mystery cult" and "adventure psychonautics". An object which had been originally developed as the result of a cooperation between Neurology and Psychology to influence the brain has made the jump to work of Art. 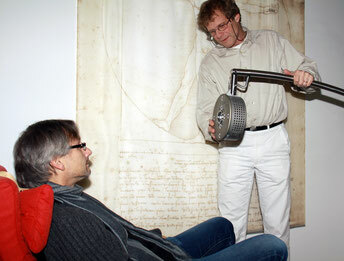 Or, better said: It’s opened up a wholly new way to experience Art. When Lucia N°03 was made available to a wider audience five years ago, other target groups developed a growing interest in the lamp. Architects, designers, graphic designers, musicians – creative professionals of all sorts seemed to profit from the colorful, overpowering light universe that Lucia N°03 delivers. The potential of the hypnagogic light experience for stimulating creativity was recently proved by a one-year study carried out by Ralph Buchner, a high-school teacher from Munich. He allowed the pupils attending his Design class at the High-School for Applied Technologies to experiment with Lucia N°03 for one year, collecting their experiences and writing a paper about the experiment. The result surprised Buchner, whose summary report stated, “During my 15 years as a teacher, I’ve never led a project with comprable qualitative and quantities results. Never before have pupils experimented with something for the whole semester with the sam enthusiasm“. The inventor of Lucia N°03, Dr. Engelbert Winkler, explains the increase in creativity by claiming how “thoughts blockers“, for example, which are deeply-rooted in our interpretation patterns, are freed during the altered state of consciousness. Man has been looking for similar states of altered consciousness since time immemorial to receive answers, to cleanse the soul or to come up with new ideas. Just think of the Incubation Mysteries in Ancient Greece, shamanic rites, or consuming psychotropic substances. There have always been people who report on awareness that cannot be described in words and that is all-encompassing. Indeed herein also lies the reason for enlightenment to be seen as something desirable. It is more appropriate to speak of natural consciousness, awareness of being, which – superimposed by thinking and feeling – is easy to overlook. Tracks of enlightenment processes can be traced back to ancient times. Under special conditions, a “light experience” leads to profound changes in attitude and thus to a total reorientation of the organism. This prompted Dr. Dirk Proeckl neurologist and Dr. Engelbert Winkler psychologist, psychotherapist to investigate the neuropsychological contexts of this phenomenon in more detail. They took the fact that the brain does not recognize a difference between imagination and real events in key functional areas, and therefore involved external light sources in their work from the very beginning. Eventually they managed to achieve the desired light effect using a combination of certain frequencies of pulsed light. In doing so, Lucia N°03 was originated in the middle of the Tyrolean Alps - not as an assembly line product, but as a small-batch series from a factory in Kufstein…. Lucia N°03 is a computer-controlled lamp system that combines a stroboscope (flickering light) featuring variable speed and intensity with a constant light operating in different brightness levels. The interplay of these nine light sources (8 LEDs and 1 halogen light) is internationally patented and makes Lucia N ° 03 to a technologically leading pioneer. All components used meet the highest quality standards. Design and software come from Austria. Lucia N°03 is handmade in Austria and shipped worldwide after careful final inspection. 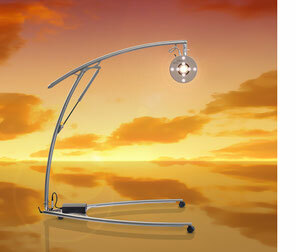 Lucia N°03 is used for the induction of the Hypnagogic Light Experience. The price includes the obligatory Light Attendant Training, which contains theoretical and hands-on experience along with integrating the device in already existing context. Operation of the device is basically simple. Taking into account the safety precautions, each Light Attendant learns to apply and personally create individual sessions during the training. Every Light Attendant has access to Lucia Academy. factory Duty in Austria, Taxes and Shipping are not included.